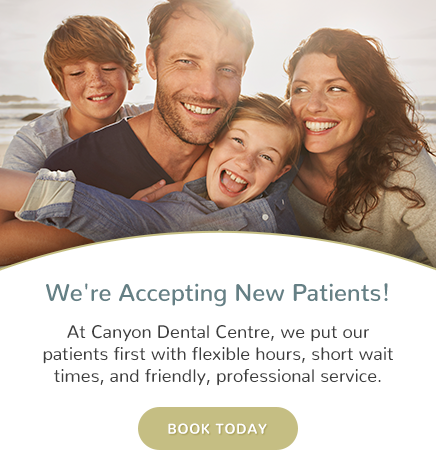 At Canyon Dental Centre in North Vancouver, we provide composite fillings and crowns for dental restoration. A composite (tooth coloured) filling is used to replace old silver fillings, damaged or decayed teeth and repair a tooth that is affected by cracks and fractures. The decayed or affected portion of the tooth will be removed and then filled with a composite filling that is invisible in the smile, beautifully restoring teeth to health, strength and appearance. As with most dental restorations, composite fillings are not permanent and may someday have to be replaced. They are very durable and can last many years. Why might I need a composite filling? A custom-made crown or “cap” completely covers the top of a tooth. Crowns not only repair and strengthen a damaged tooth but can improve the appearance. A crown is used to entirely cover or “cap” a damaged tooth. Besides strengthening a damaged tooth, a crown can be used to improve its appearance, shape or alignment. A crown can also be placed on top of an implant to provide a tooth-like shape and structure for function. Porcelain or ceramic crowns can be matched to the colour of your natural teeth. Why might I need a dental crown?